This beautiful and luxurious river front cabin is the perfect place for a romantic rendezvous, honeymoon bungalow or the small family looking for some quality time together in nature. Cartecay Fever sits on the banks of the well known Cartecay River, known for it's trophy trout, tubing, rafting, canoeing and kayaking. Having white water rapids on several parts of the river adds excitement to the whole river experience. Relax on the spacious back porch while taking in the sights and sounds of the ever changing river. Watch as others come by on their water craft of choice or slip your shoes off and experience the cool mountain water and then enjoy sitting on one of the huge river rocks right in your own backyard. Inside, you will find charm and character with reclaimed barn wood throughout, custom, handmade furniture from a local craftsman and the attention to detail that will bring you back time and time again. The Queen Master with 37" flat screen on the main level has access to the covered porch with hot tub, overlooking the river. The beautiful, well appointed kitchen with all stainless steel appliances provides all you need to whip up some fabulous meals. There is a large, full bath with double vanities and a stunning custom rock walk-in shower. 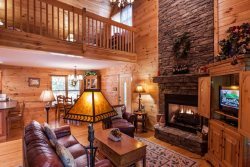 The cozy living room offers a 42" flat screen, DVD player, Wi-Fi and a gas log rock fireplace. There is a large loft that houses 2 queen beds, perfect for the kiddos or another couple sharing this wonderful mountain experience with you. Located only 10 minutes from downtown Ellijay, home of the famous North Georgia Apple Festival and 20 minutes from Blue Ridge. where unique shopping and exquisite dining abound! Cartecay Fever is one of those places you will be so glad you found and can't wait to get back to! Updated, gorgeous and cozy cabin right on the water! The pictures don't do it justice, but it is a great cabin. It easily fits 5-6 people with a large bathroom. The staff was great and it's only 10 minutes from downtown. Great place! We had a wonderful, peaceful stay. Wish we didnt have to leave. My overall stay was amazing. It was a beautiful cabin, and the river that flowed through the back made it worth the stay! loved it, thank you so much!!! We throughly enjoyed our stay with Mountain Oasis! It was a great weekend away for my little family. It was a quaint cabin that enabled us to have a weekend of much needed family time. We cant wait to come back! It was amazing, can't wait to come back. It was everything we expected and more. We enjoyed our stay. It was very relaxing listening to the rain on the tin roof and soaking in the hot tub made our stay so peaceful in the beautiful surroundings. Our experience renting was convenient and stress-free. Loved the cleanliness of the cabin. The Cartecay Fever cabin exceeded our expectations, easy to get to, great parking, the cabin is very spacious for a small cabin, very clean, great lounging deck overlooking the river, the yard is nice and you can walk down to the river, my Jack Russell's enjoyed playing in the river and in the yard, our trip was short but very enjoyable thanks to Angie, she handled everything from the reservation (very short notice) to the directions and future waterfront cabin rentals. Looking forward to our next adventure with Mountain Oasis Cabin Rentals. Finding a place to stay that suits your needs is not that easy to find. When I found the cabin I wished to stay at, everything was made so effortless by Mountain Oasis. When I made calls, the lady was pleasant and friendly which makes all the difference to me. When we left, it was all so easy as well. We thank you for a wonderful stay and we will no doubt stay again.